The Land Conservancy has no paid staff. It is run entirely by volunteers who are dedicated to preserving vital habitat for species survival. Every penny the Land Conservancy receives from members, donors, and funders is used for land acquisition and stewardship. Annual operating and property stewardship costs are $8,000. We set aside money in a land acquisition fund so that we are ready to cover acquisition costs, such as appraisals, when a donor offers a property to us or when we buy a property that is important to preserve in its natural state. We have a land acquisition policy and are developing a natural heritage action plan to identify priority areas for protection. To cover the ongoing costs of property ownership and conservation easement management, we maintain a stewardship account to generate sufficient annual income to cover property taxes, property insurance, and other expenses related to property responsibilities. We also have money set aside in the Natural Areas Protection Fund which is endowed with the Community Foundation for Kingston & Area. We follow the Canadian Land Trust Standards and Practices and are members of the Ontario Land Trust Alliance, a charitable organization supporting land conservation and land trusts in Ontario. The Land Conservancy holds conservation easements on two properties, totaling 85 hectares (212 acres), one near Westport and the other on the Salmon River, with 990 meters of shoreline. A conservation easement limits further human use of the land, preserving natural features in perpetuity. 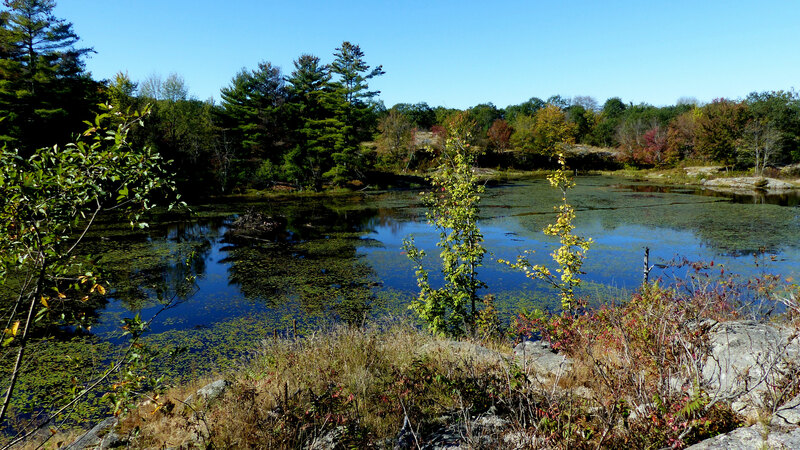 The Ontario Land Trust Assistance Program provided $14,195 to assist with the acquisition of the Arthur Nature Reserve, the Lee Nature Reserve, Salmon and Snake Islands, and the two conservation easement properties. Financial support for the Ontario Land Trust Assistance Program was originally provided by the Ontario Ministry of Natural Resources and more recently by The Government of Canada Habitat Stewardship Program for Species at Risk. A 16-hectare (40-acre) lakefront property, was kindly given to the Land Conservancy by Dr. Diane Arthur. It is protecting nine species at risk, including the Eastern Black Ratsnake. It is an EcoGift. A 12.5 hectare (31 acre) triangle of land on the west side of the Salmon River adjacent to the Mellon Lake Conservation Reserve. It has 914 metres of shoreline. The land is characterized by granite cliffs rising in successive ridges away from the river, and features several habitats, including rocky barren outcrops, deciduous woods, and riverine wetland. The property is home to Five-lined Skink, a species of special concern. The Lee Nature Reserve was the gift of Steven Lee, and qualified as an EcoGift. Located about one kilometre off Kingston’s shoreline. The islands are small rocky outcrops that have been the subject of Canadian Wildlife Services research for almost 40 years. They were the gift of Dr. James Day and Robert Carson, and qualified as EcoGift. The Toronto Star profiled the islands as home for Ring-billed and Herring Gulls in this 2011 report. in Kingston and Frontenac and Lennox and Addington counties. To create a Land Conservancy that people throughout Frontenac and Lennox and Addington Counties will recognize as a trustworthy and far-sighted organization, preserving and protecting natural sites and landscapes in this area. The communities will see value in our goal of protecting representative significant natural habitats, supporting biodiversity and connecting natural areas across the counties, and will respect efforts to encourage land stewardship through cooperation with other environmental organizations and support for landowners. The Land Conservancy will be seen as a key partner in protecting the ecological integrity of this part of Ontario. Incorporated as a federal not-for-profit corporation in 2004. Funders We are very grateful to funders who have supported land acquisition, stewardship projects, training, and other activities. Memberships, donations, and investment revenue support the Land Conservancy’s work. For any new acquisition, by gift or purchase, we set aside at least 10% of the appraised value of the property in a stewardship account. This ensures our capacity to preserve the property over the long term. We also have an endowed fund with the Community Foundation for Kingston & Area, the Natural Areas Protection Fund. This Fund provides an additional source of funds for property stewardship costs. The capital in this Fund is permanently invested with the Community Foundation. We receive an annual grant from the Fund. The purpose of this fund is to generate money to pay annual stewardship costs for Land Conservancy properties. The Natural Areas Protection Fund is endowed with the Community Foundation for Kingston & Area. The capital in this Fund is permanently invested with the Community Foundation. We receive an annual grant from the Fund. If you would like to support the stewardship of Land Conservancy properties please make a donation to our stewardship account or to the Community Foundation and designate it for the Natural Areas Protection Fund of the Land Conservancy. Read articles about us or about land trusts in general. June 2014 article in Vista magazine entitled Green Matters describing our land conservancy and how it helps protect natural spaces. 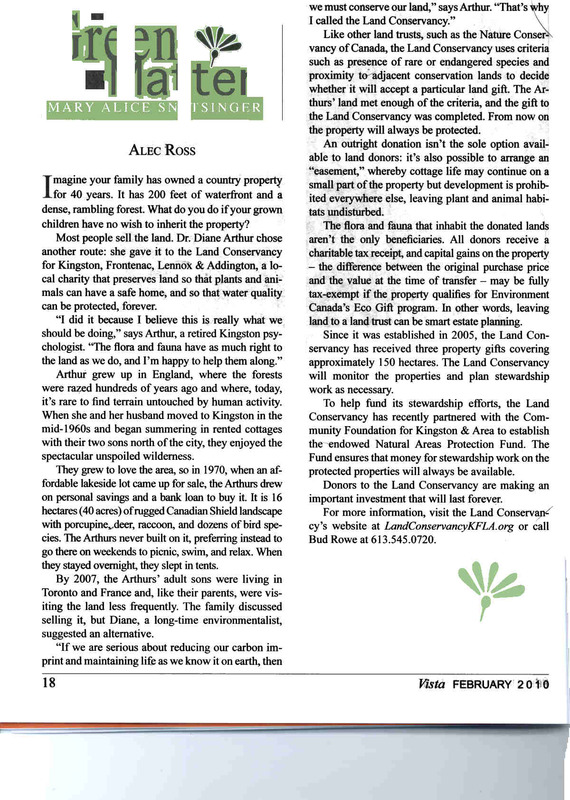 The article notes that the Land Conservancy for Kingston, Frontenac, Lennox and Addington is celebrating its tenth anniversary in 2014. This article is supplied courtesy of the Seniors Association of Kingston. 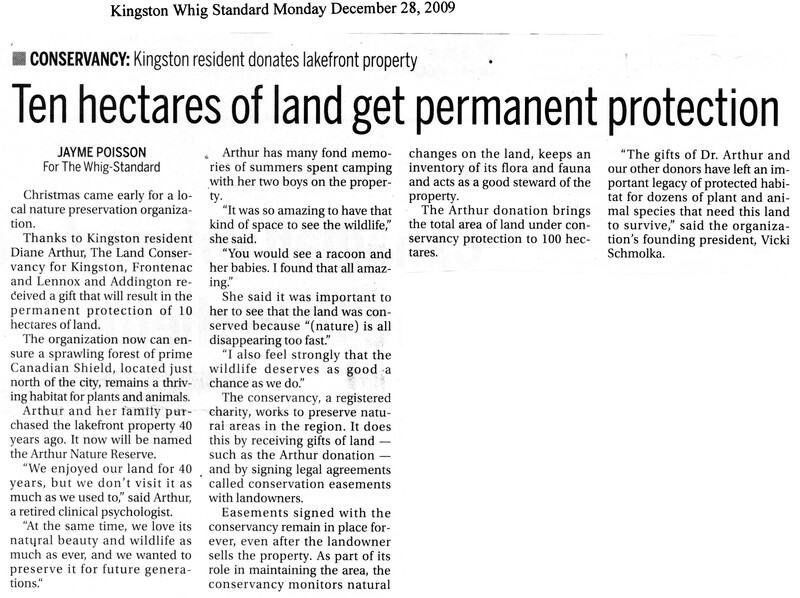 April 5, 2011 coverage in Kingston This Week announces an important property donation to our land conservancy. An article in the December 29, 2009 Kingston Whig Standard also described this property donation. Alec Ross’s article in the February 2010 Vista specifically speaks to a donation to our land conservancy. Wood Gundy (Kingston)’s newsletter in January 2009 ably captured the basic concepts around land trusts.